Alloa Tower is the ancestral home of the Erskine family, Earls of Mar and Kellie. It is one of the largest surviving medieval tower houses in Scotland. The Tower was built around 1368 to guard the north side of an important ferry crossing on the River Forth. The Erskines traditionally acted as guardians to children of the Stuart monarchs. Mary, Queen of Scots spent part of her childhood here, as did her son, James VI. Mary rewarded the Erskines for their loyalty to the Stuart cause by giving them the Earldom of Mar in 1565. When Mary was deposed in favour of her infant son James the 1st Earl was made Regent of Scotland on his behalf. 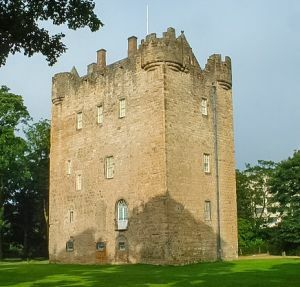 Alloa Tower was home to the John Erskine, 6th Earl of Mar, who led the 1715 Jacobite Rebellion. It was the 6th Earl who transformed the forbidding medieval tower house into a comfortable residence. 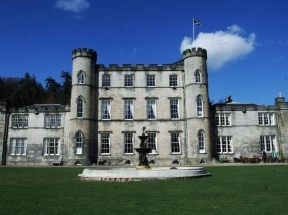 Erskine was inspired by the architecture he saw on his Grand Tour of Europe in the early 18th century. He was determined to transform his family home into an opulent mansion. Work was still unfinished in 1715 when Erskine helped launch the Jacobite rising. We the rising failed Erskine was forced to flee abroad. The original medieval tower was extended with a larger mansion, but this was destroyed by fire in 1800. In the mid-19th century a second mansion was built, but this, in turn, was torn down. The Erskine family moved out of the medieval tower and it fell gradually into decay. The almost derelict building was rescued by the Clackmannanshire Council and restored to its former glory in a project that took six years to complete It is now in the care of the National Trust for Scotland. The interiors feature original oak beams and roof vaulting, along with a fine collection of art. At the heart of the Tower is the solar, or private family chamber, with its original medieval roof timbers. Less salubrious is a pit dungeon. There are fabulous views from the rooftop walk, where you can see across 9 counties on a clear day.